The USA PAN Nonstick 6-Well Popover Pan is the perfect nonstick baking pan for producing tall, light, fluffy popovers with an airy interior and crispy exterior. Featuring deep wells and innovative cup design, the popover pan promotes enhanced air circulation, causing the popover batter to rise quickly and produce perfectly golden-brown domes. 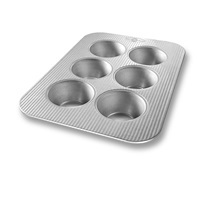 Perfect for bakers who aren’t satisfied with the standard cupcake or muffin, the USA PAN 6-Well Texas Muffin Pan will bake 6 Texas-sized muffins large enough to satisfy any sweet tooth. 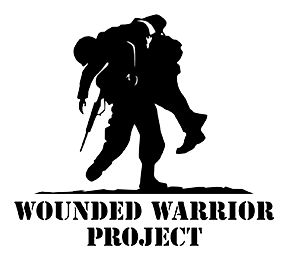 Try out classic chocolate or vanilla, red velvet, carrot cake, pumpkin, or coffee flavored muffins and cupcakes recipes! Our proprietary AMERICOAT® nonstick coating provides quick and effortless food release, flawless baked goods and easy clean-up. The USA PAN Swirl Cupcake Pan provides home bakers with an easy way to bake elegant swirl cupcakes for parties, events, and family functions. A simple twist on a baking classic, the swirl cupcake is perfectly finished with a variety of glazes such as a rich chocolate glaze or simple confectioners’ sugar glaze. Our proprietary AMERICOAT® nonstick coating provides quick and effortless food release, flawless baked goods and easy clean-up. 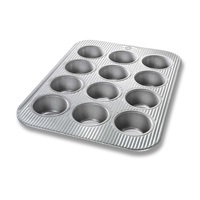 The USA PAN 6-cup Variety Cakelet Pan is a versatile cupcake pan that provides home bakers with an easy way to bake a variety of fun and elegant cupcakes for parties, events, and family functions. This pan features 3 different fun-filled designs: fluted, starburst, and swirl! Our proprietary AMERICOAT® nonstick coating provides quick and effortless food release, flawless baked goods and easy clean-up. 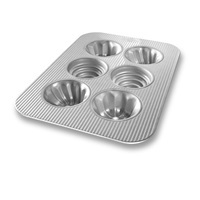 The USA Pan 12 Cup Cupcake and Muffin Pan measures a full 2.75 x 2.0625 x 1.375 inches in each cup. 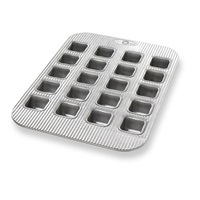 This pan allows you to make the perfectly sized on the go muffins or cupcakes for birthday parties. 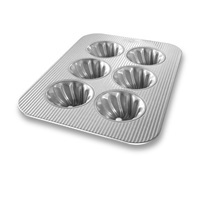 The USA PAN Mini Fluted 12-Cup Cupcake Pan is a specialty pan that provides bakers with the perfect way of baking miniature fluted cupcakes! 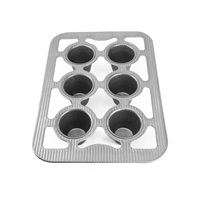 The fluted design will give your cupcakes a unique shape to serve to friends and family. Try out different recipes like strawberry or funfetti, to add a pop of color that your friends and family will enjoy. Our proprietary AMERICOAT® nonstick coating provides quick and effortless food release, flawless baked goods and easy clean-up. 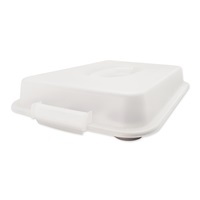 The 20-Well Brownie Bite Pan is a specialized pan designed to make the perfect bite-sized chocolate brownies, blondies, and other sweet snacks. Simply pour your batter or mix into the perfectly shaped wells, stick it in the oven, and enjoy your fun-sized snacks. Our proprietary Americoat® nonstick coating provides quick and effortless food release, flawless baked goods and easy clean-up. 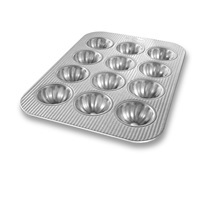 The USA PAN 24 Cup Mini Muffin Pan allows you to make the perfect sized miniature muffins to gift or give out at family gatherings. Make a variety of different flavors like blueberry, apple, and banana muffins. 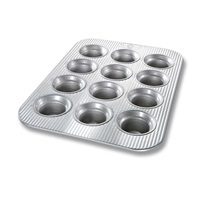 The USA PAN 12 Cup Crown Muffin Pan provides home bakers with an easy way to bake the perfect blueberry, chocolate chip, or cornbread muffins. 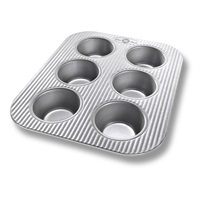 With a flared out crown molding, the USA PAN 12 cup Crown Muffin Pan is the perfect pan for baking beautifully domed muffins with crowns on top just like the ones you can buy at a commercial bakery. Our proprietary Americoat® nonstick coating provides quick and effortless food release, flawless baked goods and easy clean-up. 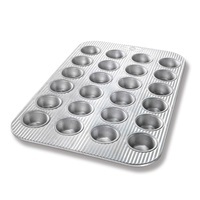 The USA PAN 6 Cup Muffin Pan provides home bakers with an easy way to bake the perfect blueberry, chocolate chip, banana, or cornbread muffins. 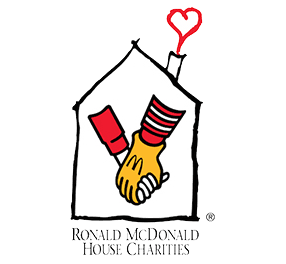 Try out your favorite cupcake recipes from classic chocolate or vanilla, to red velvet, carrot cake, pumpkin, or coffee flavored cupcakes! Our proprietary Americoat® nonstick coating provides quick and effortless food release, flawless baked goods and easy clean-up.